Leicester City’s unlikely march to the Premier League title shows no signs of slowing down, after another weekend where their rivals seem intent on making life easy for them. Claudio Ranieri’s team are five points clear with nine games to go following Saturday’s 1-0 victory at Waftord. Tottenham Hotspur’s 2-2 draw with Arsenal left them in second place, and with the Gunners a further three points behind in third, a first-ever title success for the Foxes is becoming an increasing possibility. Riyad Mahrez grabbed the winner for Leicester – his 15th goal of the season and 11th away from home. With their next three fixtures against Newcastle United, Crystal Palace, and Southampton all looking winnable games, the 5,000-1 longshots for the title at the start of the season have the perfect opportunity to keep up the pressure on the chasing pack. Spurs had come from behind against Arsenal to lead 2-1 heading into the final 15 minutes, but Alexis Sanchez’s first league goal since October sealed a valuable point for the visitors. Manchester City’s 4-0 win at home to Aston Villa has kept them fourth, ten points behind Leicester with a game in hand. Juan Mata’s early red card was the catalyst for Manchester United’s downfall, as Salomon Rondon scored the only goal of the game for West Brom to end a run of four successive wins for Louis van Gaal’s team. The result saw United drop to sixth after West Ham’s 3-2 win at Everton, and Van Gaal was unhappy with the sending-off, venting his fury at both Mata and referee Mike Dean after the game. While the big teams struggle to keep pace with the Foxes, Ranieri believes he can deliver the club’s first title in their 132-year history. WATCH: Claudio Ranieri dismisses claims that Mahrez is on the move. “I know it is a good moment for us but there are nine matches left and every match is difficult and a battle, but not only for us, but for the rest of the league,” he said. 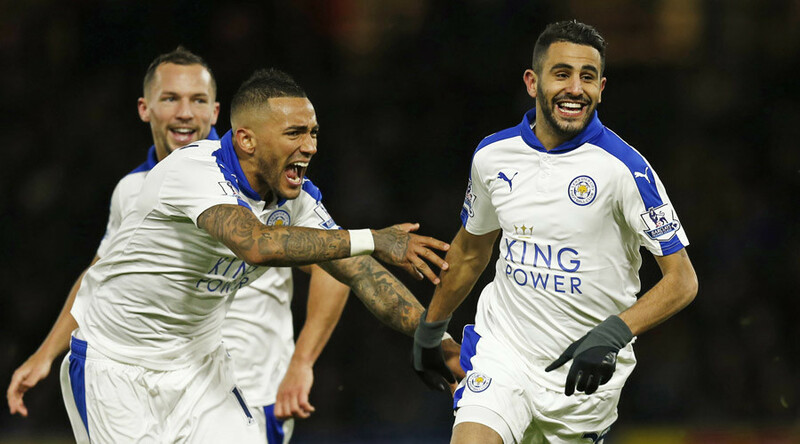 A Leicester victory in this year’s Premier League title race would arguably be the biggest shock in sporting history, eclipsing Greece winning UEFA Euro 2004 or the St. Louis Cardinals’ unlikely late season run in 2011 that led to them claiming baseball’s World Series crown.